cell culture supernates, cell lysates and serum. 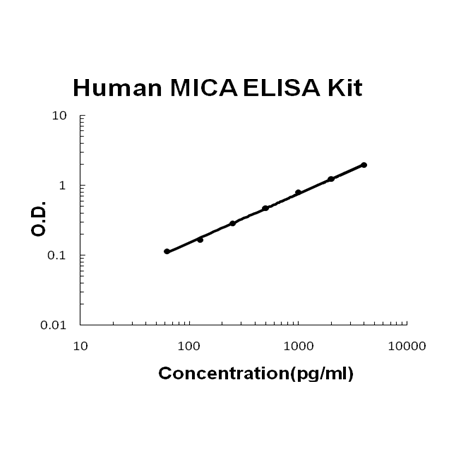 Sandwich High Sensitivity ELISA kit for Quantitative Detection of Human MICA. 96wells/kit, with removable strips. cell culture supernates, cell lysates and serum. . Widely expressed with the exception of the central nervous system where it is absent. Expressed predominantly in gastric epithelium and also in monocytes, keratinocytes, endothelial cells, fibroblasts and in the outer layer of Hassal's corpuscles within the medulla of normal thymus. In skin, expressed mainly in the keratin layers, basal cells, ducts and follicles. Also expressed in many, but not all, epithelial tumors of lung, breast, kidney, ovary, prostate and colon. In thyomas, overexpressed in cortical and medullar epithelial cells. Tumors expressing MICA display increased levels of gamma delta T-cells. . Cell membrane ; Single- pass type I membrane protein . Cytoplasm . Expressed on the cell surface in gastric epithelium, endothelial cells and fibroblasts and in the cytoplasm in keratinocytes and monocytes. Infection with human adenovirus 5 suppresses cell surface expression due to the adenoviral E3-19K protein which causes retention in the endoplasmic reticulum. . Seems to have no role in antigen presentation. Acts as a stress-induced self-antigen that is recognized by gamma delta T- cells. Ligand for the KLRK1/NKG2D receptor. Binding to KLRK1 leads to cell lysis. .
MHC class I polypeptide-related sequence A is a protein that in humans is encoded by the MICA gene.1 The MICA gene encodes a 383-amino acid polypeptide with a predicted mass of 43 kD.The MICA and MICB genes occur in a 200-kb region spanning the TNFA and TNFB cluster at 6p21.3.2 MICA and the closely related MICB were recognized by intestinal epithelial T cells expressing diverse V-delta-1 gamma/delta TCRs.3 The MICA protein product is expressed on the cell surface, although unlike canonical class I molecules does not seem to associate with beta-2-microglobulin. It is further distinguished by its unusual exon-intron organization and preferential expression in fibroblasts and epithelial cells. It is thought that MICA functions as a stress-induced antigen that is broadly recognized by NK cells, NKT cells, and most of the subtypes of T cells. MICA and other members of this family may have been selected for specialized functions that are either ancient or derived from those of typical MHC class I genes, in analogy to some of the nonclassic mouse H-2 genes.